Ohio Wesleyan University will host three sessions of OWjL Camp in June for gifted middle-schoolers from nine central Ohio counties. The youths will take classes in mathematics, logic, computing, science, humanities, and creative development. And the 545 gifted and talented sixth-, seventh-, and eighth-graders selected to attend Ohio Wesleyan University’s 37th annual OWjL summer camp in June learn other valuable lessons, too, said Susan Paxton, executive director of the residential camp. “They meet other students like themselves and, as a result, they learn it’s OK to be smart,” Paxton said, noting that many have never visited a college campus, taken accelerated classes, or been surrounded by peers deemed to be among the nation’s most academically advanced middle-schoolers. Students invited to attend OWjL camp are nominated by principals, guidance counselors, or teachers from schools in Delaware, Fairfield, Franklin, Licking, Madison, Marion, Morrow, Pickaway, and Union counties. The students all have earned high test scores on nationally normed tests and demonstrated exceptional talent, creativity, or leadership. 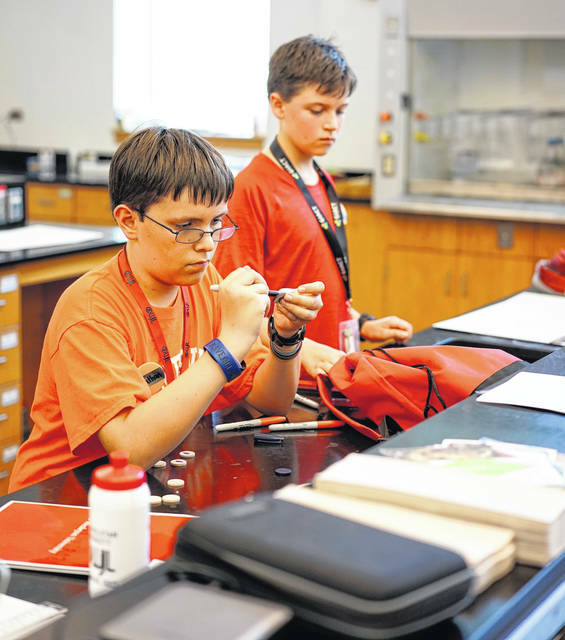 While living for a week on the Ohio Wesleyan campus, the OWjL campers choose from more than 50 classes in mathematics, logic, computing, science, humanities, and creative development. This year’s OWjL teachers include nine Ohio Wesleyan faculty, staff, and alumni, as well as national board-certified secondary school teachers, teachers of gifted and talented students, and other experts in their fields. The camp counselors are students from Ohio Wesleyan and various colleges and universities. The 2018 camp includes three weeklong sessions running from June 10-15 (grades six and seven), June 17-22 (grades seven and eight) and June 24-29 (grades six and seven). Pronounced “owl,” the camp’s acronym stands for Ohio Wesleyan/Junior League of Columbus. Ohio Wesleyan and the Junior League founded it in 1981, following a two-year study that determined gifted and talented middle school students were underserved during the school year with programs to promote discovery and foster skills in problem-solving, critical thinking, creativity, research, leadership, and communication. Nearly 16,000 children have benefited from the OWjL experience since the camp was founded. Learn more at www.owu.edu/owjl. Founded in 1842, Ohio Wesleyan University in Delaware is one of the nation’s premier liberal arts universities. Through Ohio Wesleyan’s signature OWU Connection program, students integrate knowledge across disciplines, build a diverse and global perspective, and apply their knowledge in real-world settings. Learn more at www.owu.edu.